In between shows, traveling, using toilet paper and duct tape as survival tools and dabbling in “casual amateur meteorology” they took time to answer a few questions for us. BEN: I have heard you guys say you are in the midst of somewhat of an artist evolution or transitional period, are you able to elaborate further on what you mean by this? NORTH: We are. We’ve lost members and that’s forced us to compensate. We can also agree that the evolution can be summed up as having to adapt to a heavier and more evenly-weighted share after losing a few limbs. B: Which of the following best describes your creative process and why – democracy, dictatorship, socialism or anarchy? North: Zack says it’s the purest form of democracy: anarchy. We’ve shifted from an oligarchy. Everyone’s input is equally valued in the service of creating one specific sound or set of sounds. B: You spend a lot of time on the road, do you have any touring survival tips or hints to share with us? North: Zack and Evan’s tip is duct tape and toilet paper – separately, or used in tandem (however Evan hasn’t run across that yet.) Yelp also has been crucial in finding good local food. B: Is there any particular place you are yet to tour that you are especially keen to play (Australia? hint, hint) and conversely – is there anywhere you have played and never want to visit again? North: We’d love to get to Europe, anywhere in Europe really. Japan, and Australia would be phenomenal too. If anyone would like to book us there, come find us. We won’t call anyone/any city out because there are multiple variables that affect any given night, but some places are definitely on a repeat offender list. Boise (Idaho), we’re looking at you. B: Your resume is peppered with an impressive list of shows at which you have performed with some of the bigger names in heavier music – so just between you and I – is there any of these bands you wish to either praise or push under the bus for their treatment of you and their touring habits? B: How do you balance the demands of “real life” with the demands of the band? North: Essentially we all work pretty strenuously when we’re off the road to accommodate a touring and recording schedule that has been continuously tested, coupled with the fact that one of us is in school, and one of us works in a different state. It incurs the expected stress but we’re approaching our ninth anniversary in August, which is celebrated by a 22-day loop to the east coast and back. This relationship has been pretty weathered. B: Have there been any identifiable non-musical influences on your work and/or life – i.e. authors, artists or ethos’? North: Zack: Too many authors: Orwell, Tolkien, Bradbury, Huxley, Martin, Leguin, Asimov, Sanderson, Abercromie, Sagan, Bukowski, Adams, Herbert, Steinbeck, Vonnegut, Chomsky, Gaiman, Rothfuss, Rowling; good quality television shows and their showrunners that have seemingly transcended the medium; the beauty of nature, mountains, rivers, streams, the Arizona desert; and the struggle against racism, sexism, fascism, capitalism, and the institutionalized oppression brought forth by the patriarchal oligarchy of the ruling class. B: What are the plans for North in the immediate future? 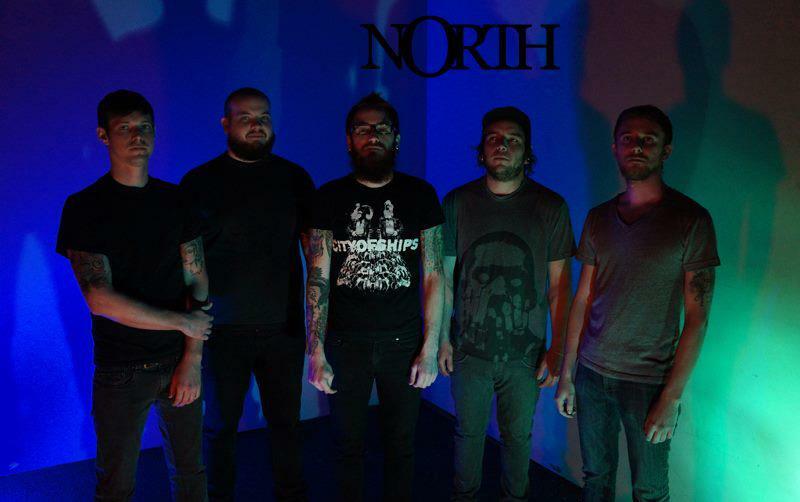 North: More tours of the country in all sorts of different directions, and writing enough material for a new full-length accompanied by a heavy round of touring.